Harbor Keeper President Fred Krupp begins Friday’s meeting in Cornerstone Community Church, concerning the Connecticut Department of Transportation’s plans to rebuild the Walk Bridge. “The thing about democracy is it takes people to speak up and let the elected officials know where we are,” Krupp said. NORWALK, Conn. – There are less disruptive ways of rebuilding railroad bridges, Patrick Sikes said Friday, of the state’s plans to replace its problematic, ancient, railroad bridge over the Norwalk River. “The rush to have this done doesn’t really make sense to us and we would like a full examination of why it does, and that’s really the thing we are asking for,” said Sikes, a member of Norwalk Harbor Keeper, a conservationist group that has filed a federal lawsuit to challenge the Connecticut Department of Transportation’s plans to replace the aged Walk Bridge with a modern lift bridge. Talk of environmental jeopardy was a key feature of Friday’s meeting in Cornerstone Community Church, which drew more than 40 people, with comments about the expense of Connecticut’s plans and assertions that there’s no need to keep the upper harbor open to tall-masted ships, as a lift bridge would do. It shouldn’t cost $1.1 billion, Robert Kunkel said, with Tony D’Andrea replying that the estimate is $1.2 billion now. “I haven’t heard any new estimates lately, but that doesn’t sound too different from the estimates we’ve been hearing all along,” Assistant to the Mayor Laoise King said in a Sunday email. ConnDOT plans public information meetings about the Walk Bridge on May 22. The project has been at the “30 percent design” milestone for more than two years. King said she understands it will jump to the “60 percent” phase in June. ConnDOT in September 2016 announced that it had chosen the long span vertical lift bridge as its preferred option. That bridge would go up 63 feet to mirror the height of the Yankee Doodle Bridge, the bridge that carries car traffic on Interstate 95 over the river, Kunkel said Friday. “At this point in time there is really nothing that is going to travel up that northern end of the river because of the water depth, that will have a mast height, or a pilot house height, of 63 feet,” Kunkle said. D’Andrea, a former Harbor Management Commissioner who served for years as its chairman, said the city is working to rezone properties along the upper harbor. The Redevelopment Agency hired the non-profit Regional Plan Association (RPA) to draft a plan for the West Avenue/Wall Street area. That plan is undergoing a revision. There are 13 tall-masted ships that are stored north of the bridge during the winter, Sikes said, with Kunkel asserting that the Walk Bridge opened 31 times last year for one boat. Shellfish Commission Chairman Pete Johnson asked why the bridge couldn’t be fixed. ConnDOT officials have said that the bridge is too old to leave in place. “You can’t weld the bridge shut. You would have to get rid of that structure,” Mayor Harry Rilling said in March. Harbor Management Commissioner John Romano in November 2016 said he’d weld it shut himself, but relayed ConnDOT thoughts that the bridge’s underpinnings and foundations are poor and would have to be replaced. Johnson said there’s an untold amount of chemicals under the bridge, which would be dislodged during construction. Kunkel said he’s done projects in Korea and Asia and there’s no way to stop waterborne pollutants from spreading. 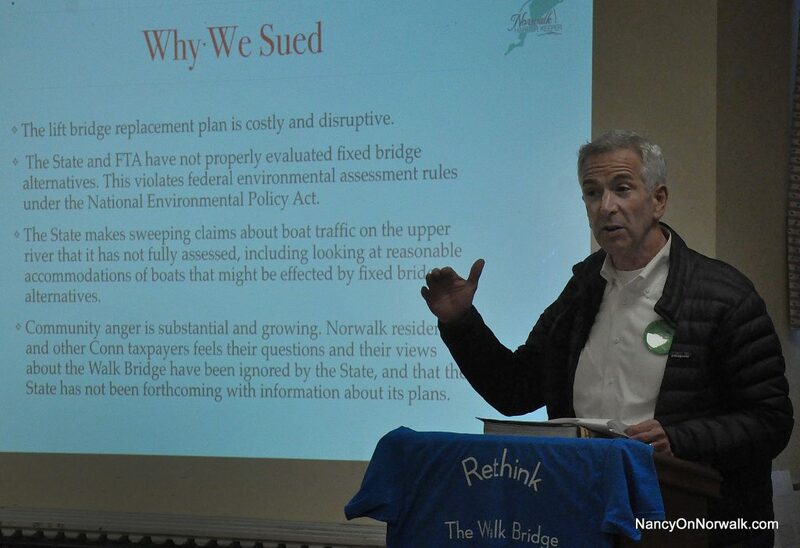 “It can be as simple as test facilities that may shut the project down if it reaches certain levels but the bottom line, and the reason we are doing this educational work and why we have stood up as the Norwalk Harbor Keepers, is we don’t have those answers and nobody is giving us those answers,” Kunkel said. “I am a seaman and I will tell you, anything can be repaired,” Kunkel said. “The lawsuit could be settled by the hiring of an independent engineer. So don’t mistake us for just saying they claim that they look at it,” said Harbor Keeper President Fred Krupp, listed in the lawsuit as a plaintiff. The Walk Bridge reconstruction will result in the “permanent disfigurement of our town,” Isabelle Hargrove said, criticizing the look of the lift bridge selected by ConnDOT. 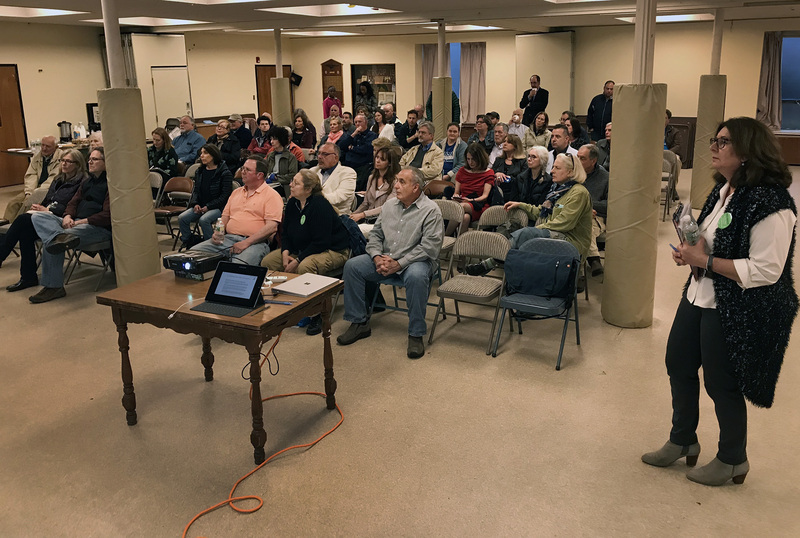 The Third Taxing District and the Second Taxing District are very concerned about the businesses that will be affected by the Walk Bridge project, and the plan to bury a transmission line under the Norwalk River has “environmental impacts that don’t appear to have been fully studied,” TTD Commissioner Deb Goldstein said. There is nothing to prevent ConnDOT from having an overhead transmission line over the bridge, as it does now, if the line is not attached to the bridge, Goldstein said. 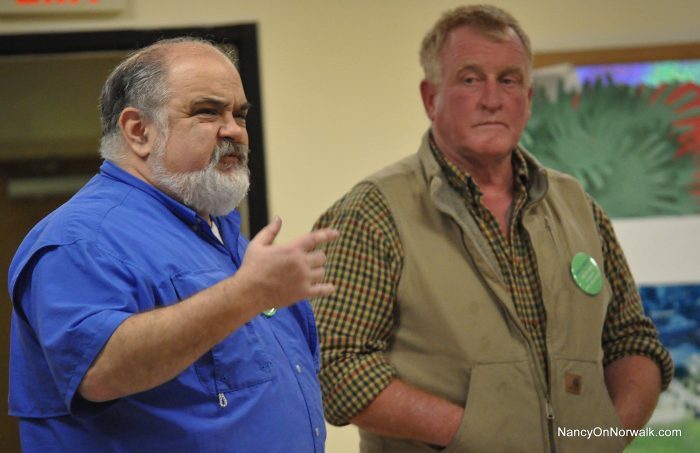 Former Harbor Management Commission Chairman Tony D’Andrea, left, opines Friday about the future of the Norwalk River’s upper harbor, while Bob Kunkel, right, listens. Kunkel said he and D’Andrea can’t figure out where Eversource will put the machinery necessary to burrow under the river. Building a new fixed bridge would require a temporary bridge next to the current bridge, which would lengthen the construction period and the environmental impact of the project, Project Manager Christian Brown of HNTB Corporation said in December 2016. D’Andrea said Friday that Norwalk would not have to pay for dredging. Robin Penna of Norwalk Harbor Keeper, right, listens Friday as her colleagues conclude a presentation listing their objections to the state’s plans to rebuild the Walk Bridge. Is there any freshman engineering student in CT or the USA who rally believes that a fixed bridge is only 10% less expensive than a 260 foot high soaring Lift Bridge requiring human Bridge openers costing tens of millions over its life span. Surely not. Only CT’’s DOT with a questionable reputation and CT’s politicians in a State facing perpetual billion dollar deficits seek a billion dollar bridge. Why isn’t Mayor Rilling leading the City’s opposition to this boondoggle and taking up Cong. Himes offer to change the status of the shallow river with the USCG ? Sure is puzzling. According to a feasibility and economic study conducted by Hardesty and Hanover for the DOT, a rehabilitation option (not even fixed), but “repair in place” would have cost 25% of what the least expensive lift bridge alternative that they studied. That study did not examine a fixed bridge option at all. It is unclear whether the 69 alternatives considered during the public hearing process was anywhere near as comprehensive as the H&H study, and if they did a complete review of a fixed bridge alternative as comprehensive as the study done by H&H. What did the state test for when they brought in the equipment? yet when Vets park docks received fines for the work there the city had to pay it, State then said it was ok to put back some contaminated soil back to the banks because what was left on the banks was just as bad. We all sat at a RDA meeting where it was said Vets park was a mess and that contamination would have to be talked about soon. Talk was from the city saying there was a lot of contamination at vets park. Final report on Oyster shell park suggests an underground river was discharging during tide change .The park was capped never cleaned up. Three cells buried in the river is also a concern why Norwalk allowed that to happen it was clearly a mistake. Yes the State has tested so if anything shows up that isn’t theirs they have proof it came from Norwalk. Go back and check the records Jay Cashman never got another job in Norwalk harbor he knew what was in the dredge , city said last round he wasn’t interested in bidding on another Norwalk job, yet he does most of the deep ports in Ct. He was never asked to come back and threatened legal action if the city said it again he would of come back . This was minutes of a counsel meeting that was passed to him. Good luck in getting what the real facts are on this one. I’ve gone back and forth on this project — on the one hand, the bridge needs to be fixed so let’s replace it with something state-of-the-art. On the other hand, I cannot believe how the cost of this has skyrocketed in such a short time. If a fixed bridge is really going to be as expensive as a new one, then fine. But show us the numbers – let’s get an independent engineering assessment. If we really do have to spend $1 billion+ for this project, this should be a drop in the bucket, and would put everyone’s mind at ease. Many lives and businesses have been severely disrupted already. Let’s make sure- really sure – that this project is moving in the right directions. To be absolutely fair, the billion dollar price tag includes the restoration of the Fort Point, Osborne and East Ave railroad bridges. It also include the cost of property takings, such as the acquisition of the IMAX theater and the rebuilding of same. Of this $161 million will come from the Feds from Hurricane Sandy money. With regard to the environmental testing, the proposed route for the Eversource transmission lines under the harbor, through the visitor’s docks and underneath Vet’s Park (a garbage dump in a previous life), escaped environmental review in the Walk Bridge’s Environmental Assessment. It will also now likely escape environmental review from the Siting Council because the statutes do not require it. The new Tappan Zee bridge is 3 miles long. 140 feet high at the peak of the 1200 foot main span. It is over 180 feet wide and will accommodate 12 full lanes of traffic. It’s towers reach nearly 500 feet in the air. It cost $4bn dollars and with 140k drivers @ $5 toll, it will recover its cost including maintenance and repairs in 25 years. And that’s with the price of concrete and steel in New York. The walk bridge covers a 500 foot span of River. 1/30th of the length of the above. Maybe 60 feet wide? And with driverless cars in the next 20 to 40 years rail road commuters will vanish. But the state wants to spend $1bn on a Cadillac design here with no plan for cost recovery, nor obsolescence. So let’s do some basic math here. 500 feet long X 60 feet wide or 30,000 square feet. Let’s say $200 million for all the extra goodies and the bridge costs a cool $900 million and the bridge will cost $30,000 per square foot. $4 billion / ( 3 miles / 5280 feet / mile X 180 feet wide) = 4 billion / 2.85 million square feet…..or roughly $1400 per square foot. AND they had to stage like 20 cranes to build it because it’s 500 feet tall. Something smells worse than low tide after a deluge here and it’s not the treatment plant. Let’s keep in mind that both Oyster Shell Park and Vets park are both former dumps for the city. And this was back in the day where everything, and I mean everything was thrown away at the dumps. Batteries, poisons, asbestos, you name it. The environmental protections put in place came later (now we take our trash and compact it and dump it in other states or international waters. Nice!) (Side note: our lovely president while distracting all of us with media craziness is gutting all those protections so all of you that think you’re saving our already blemished river from this big bad bridge have a lot bigger things to worry about). It is likely that every imaginable poison is already in that ground and riverbed. So let’s jump to 2018. The countrys infrastructure is falling apart, we are broke as a nation but we in Norwalk have the opportunity to actually be a part of fixing a major part of the northeast infrastructure and it’s in the later stages and been mostly approved. Don’t fall for typical Norwalker angst about growth or progress and let the opportunity to ugrade transportation (and the aquarium) slip by us. Question: how many of the fixed bridge supporters have financial stakes in closing down the upriver high mast marinas or industrial facilities? Maybe they want those boats south of the bridge at their marinas or want even more housing along the river? Just some thoughts to ponder as we spin our wheels yet again and work hard at losing funding. @Paul. Please send me a sapling from your money tree when you get a chance.